This section is almost entirely flat with some class II stretches. 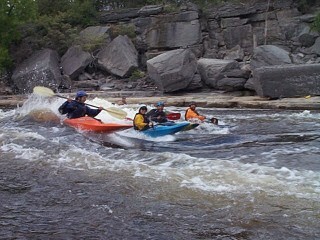 At our flows, the rapids were scrapy with tons of rocks. Most of the flatwater in the middle of the run had almost no current. There are a few houses and seasonal camps on river right, but overall, the scenery is still very beautiful with a remote feel. The whitewater picks up again at the Enos Rd. Bridge. FLOW Paddlers' Club reports potential threat to the Route 3 Wave.